The Barrie Ball Hockey Club is pleased to announce it is hosting a 3 on 3 tournament and 25th anniversary celebration August 23-25, 2019 benefiting the Neonatal Intensive Care Unit (NICU) at Royal Victoria Regional Health Centre (RVH). For More Information: visit www.ballhockey.com. If you wish to Volunteer at the event, contact brianb@ballhockey.com or miket@ballhockey.com to get involved. 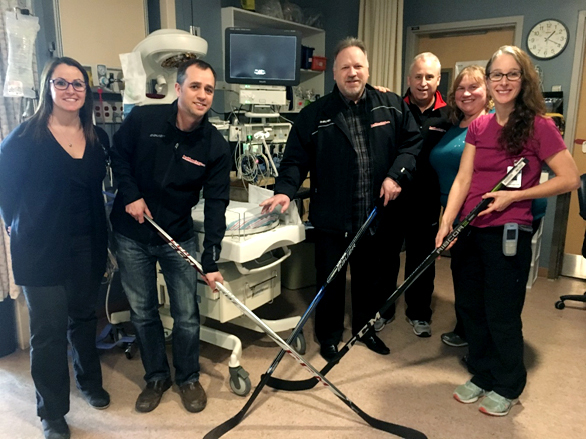 The Barrie Ball Hockey crew met with RVH employees Jolene Tomkins, Heather Davis, and resource nurse Carolyn Harrington to share their goal to raise funds for the benefit of patient care in the RVH Neonatal Intensive Care Unit. ALL CLUBS! Register early for Youth Spring Season and SAVE!